In what can only be described as a sad state of affairs, the baseball field at Jackie Robinson’s high school alma mater fell into severe disrepair. A sloping outfield, dusty infield full of pebbles, and poor dugout areas gave the field at John Muir High School in Pasadena, California a look of neglect and decay. It wasn’t always this way. Robinson and older brother Mack brought prestige and honor to John Muir. The elder Robinson was a track star there and eventually earned a silver medal in the 1936 Summer Olympics, while Jackie lettered in baseball, football, basketball, and track. 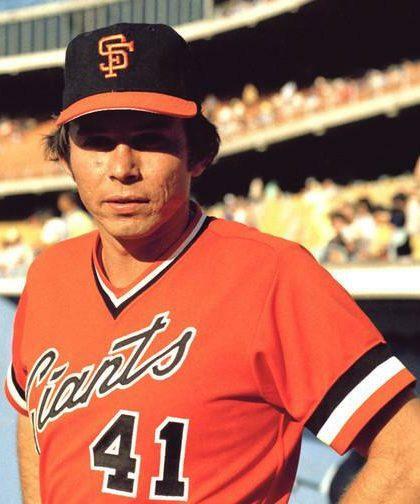 Over the years Muir produced many professional baseball players including a member of the 400-home run club in Darrell Evans who graduated in 1965. Evans was selected in Major League Baseball’s inaugural first-year player draft upon graduation. Over the first five years of the draft, MLB franchises took six Muir Mustangs. Over the next three decades 14 more Mustang players were drafted. As the 1990s ended, so too did the Mustangs’ baseball success. With the school’s declining enrollment and the emergence of basketball and football as Muir’s best sports, baseball became an afterthought. As interest in the sport waned, the Mustang teams got worse and worse, becoming a perennial doormat in the Pacific League. By the 2000s the school had difficulty fielding nine players who could catch and throw a baseball. Their uniforms grew old and tired with some players opting for jeans as game attire. That began to change when Dodger president Stan Kasten became aware of the situation. Kasten helped spearhead a facelift for the field costing more than a quarter of a million dollars. When the renovations were complete, the field and Muir’s baseball program had new life. On March 9, 2016 Kasten and a handful of former Dodgers joined Muir’s principal and other dignitaries in a dedication ceremony. The field is now one of the finest in Muir’s league. Visiting teams see pride in the eyes of Mustang players and coaches. Interest in baseball picked up on the Muir campus and their teams became competitive once again. The first year of field saw the Mustangs win two league games in a season for the first time in more than a decade. Teams that previously started their worst pitches now gave starts to their top hurlers. With the field looking worthy of the school’s proud history, even the teenaged high school players are taking notice. 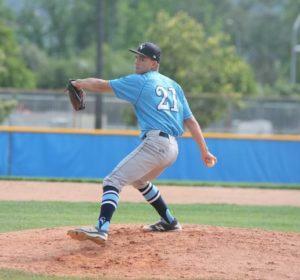 William Smiley of league foe Crescenta Valley High School pitched a no-hitter on April 19, the first no-hit game since the renovation. The wide-eyed sophomore struck out nine in the 7-inning game with only a third-inning walk standing between him and a perfect game. Pressed to talk about his dominant performance, Smiley insisted on seeing the bigger picture. 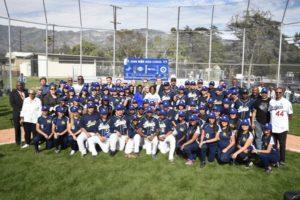 Relevant again, Muir baseball is once more attracting athletes from its student body. The country, the game, and the Dodgers gained so much from Robinson’s class and character. It’s only fitting that they all give back to the school where his love of baseball began. William Smiley of Crescenta Valley high, a league foe of Jackie Robinson’s alma mater threw the first no-hitter in the history of the new field. 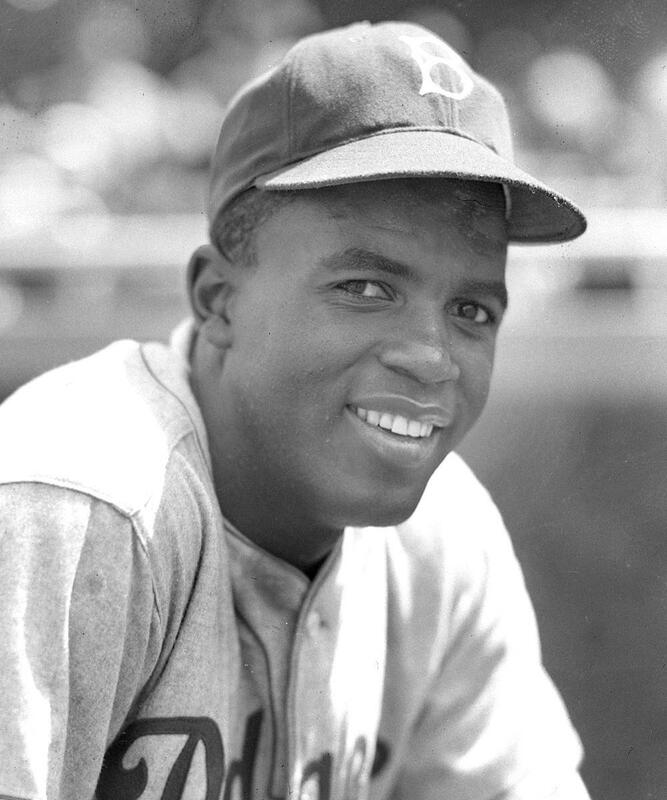 After the game all Smiley could talk about was Jackie Robinson’s baseball legacy.